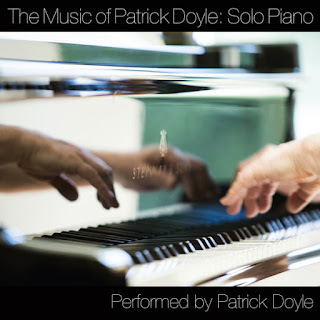 Varèse Sarabande announces the July 24th release of THE MUSIC OF PATRICK DOYLE: SOLO PIANO featuring original performances and arrangements by Oscar®-nominated composer Patrick Doyle. The collection features some of Patrick’s most revered compositions performed on piano by Doyle himself. The eighteen tracks include music from SENSE AND SENSIBILITY, GREAT EXPECTATIONS, NANNY McPHEE, GOSFORD PARK and CINDERELLA. Doyle’s career will also be celebrated later this year when he is presented with a Lifetime Achievement Award at the 15th World Soundtrack Awards in Ghent. Patrick Doyle has scored over 50 international feature films, including Rise of the Planet of the Apes, Harry Potter and the Goblet of Fire, BRAVE, Gosford Park, Sense and Sensibility (for which Doyle earned his first Oscar-nomination), Indochine, Carlito’s Way and A Little Princess. His work has led to collaborations with some of the most acclaimed directors in the world, including Regis Wargnier, Brian De Palma, Alfonso Cuarón, Ang Lee, Chen Kaige, Mike Newell and Robert Altman. Perhaps Doyle is best known for his long-time creative collaboration on film with Kenneth Branagh, which began in the theatre and moved into film in 1989 with Henry V. The song ‘Non Nobis Domine’ was awarded the 1989 Ivor Novello Award for Best Film Theme. In 1991, they re-teamed for Dead Again, which earned Doyle a Golden Globe®-nomination. Subsequent collaborations include Frankenstein, Much Ado About Nothing, Love’s Labour’s Lost, As You Like It, Hamlet (for which Doyle received his second Oscar nomination), Sleuth, THOR, Jack Ryan: Shadow Recruit, and 2015’s CINDERELLA. Enjoy the compilation of Patrick Doyle sure enjoyment you will have as you go from track to track of good score film music!